Year-over-year, water damage ranks as the costliest cause of loss among the PURE membership. Richard and Barbara Garrett purchased their Coral Gables home nearly 20 years ago. 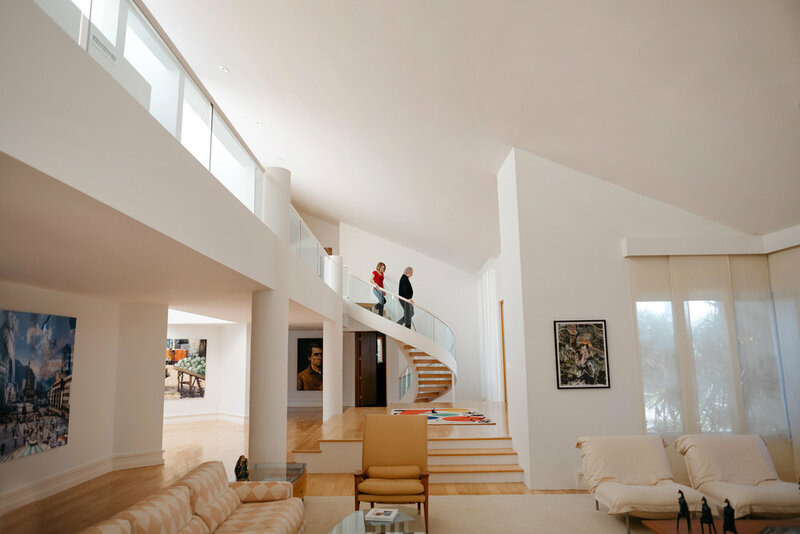 Throughout the years, they completed a series of renovation projects, which turned the 14,000-square-foot space into a reflection of the couple’s shared passions and history together. With each renovation, they added custom fixtures and hand-finished woodworking and filled the home with stunning collections of artwork and photographs. Today, Richard and Barbara may split time between their North Carolina and Florida houses, but the work they did to personalize their Florida home is something in which they take great pride. PURE members Richard and Barbara Garrett in their home in Coral Gables, Florida. The Garretts were at their North Carolina home when they received a phone call from their housekeeper in Florida. She had just discovered water leaking from the ceiling of one of their first-floor bathrooms. WATER DAMAGE CLAIMS ARE 4X MORE SEVERE AMONG THE PURE MEMBERSHIP WHEN THEY OCCUR IN A HOME THAT IS UNOCCUPIED. WHEN NO ONE IS THERE TO NOTICE IT, WATER CAN RUN UNDETECTED FOR DAYS—OR EVEN LONGER. The water was coming from the HVAC unit on the second floor. To Richard, the damage looked minor, but expert inspection revealed a much different picture. The drywalls and ceiling beneath the unit, as well as the custom wood flooring that covered the first floor of this expansive home, were all damaged. Repairs would take six months. The Garretts wanted to preserve as much of the home’s original design as possible, so they selected a contractor who gave the same attentiveness to the renovation as the Garretts gave in the initial process. PURE Claims Adjuster Bill Becker managed the process on their behalf. To repair the floor, the contractor carefully removed each warped board, replaced it with an entirely new piece to restore the flooring back to its original condition and sanded by hand the areas along the baseboards. From the beginning, Buffy Tate and her husband, Jonathan Hunt, have shared a passion for traveling. They met for the first time while Buffy was on an overseas work assignment in the Netherlands; both she and Jonathan are I.T. professionals for a multinational corporation. 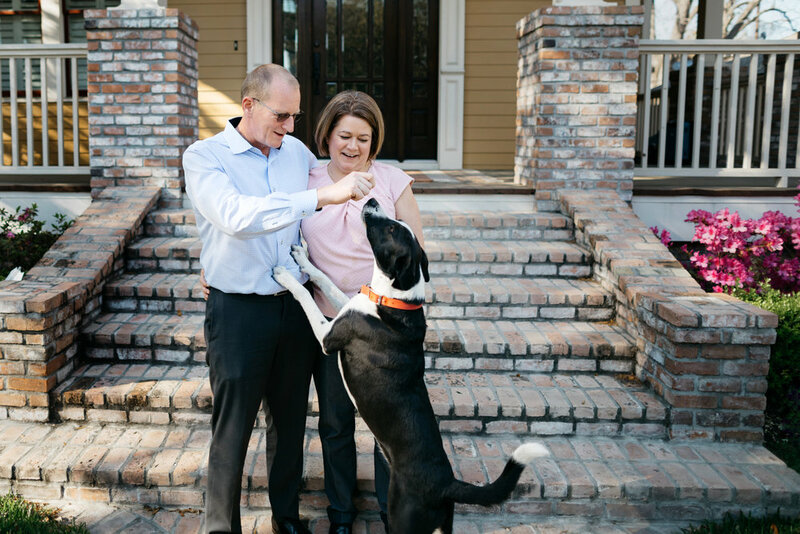 Their travels for work and family visits take them all over the world, but together with their dog, Pepper, they have made Houston, Texas, home. PURE members Buffy Tate and Jonathan Hunt along with their dog, Pepper, at their home in Houston, Texas. For Buffy and Jonathan, the extent of the damage to their home was more immediately apparent than it was for the Garretts. The couple returned from a trip to the U.K. to find their ceiling partially collapsed, along with warping and staining to the ceilings, walls and custom wood floors throughout the first level of the home. MORE THAN 20 PERCENT OF THE WATER DAMAGE CLAIMS REPORTED BY PURE MEMBERS IN 2017 RESULTED FROM APPLIANCE FAILURES. The source of the leak, once again, was the HVAC unit installed in the attic. Buffy quickly notified PURE, and within hours, a remediation specialist was on the scene to begin drying out the home. Along with other necessary repairs, the entirety of their wood floors needed to be sanded and stained and the ceilings repaired and repainted. The original builder was brought in to ensure that the integrity of the space would be preserved. In total, repairs would take three months. Buffy and Jonathan wanted to remain close to home during the renovation process, so they were pleased when PURE Member Advocate® Brenden Beiriger located a temporary home—complete with a large backyard for their dog—just two blocks away. “It is nice to have peace of mind knowing if something goes wrong, we can rely on PURE,” said Buffy. Leak Detectors. A whole-house leak detection system is designed to automatically shut off the main water supply if it detects abnormalities in the volume of water flowing through your home’s plumbing. This is invaluable in protecting against significant loss from burst pipes, toilet overflows and other plumbing-related failures. For leaks that result from independent appliances, as in the case of the Garretts and the Hunts, a location-based smart leak alarm can help. These are small devices that are placed on the floor next to major plumbing fixtures and appliances, like HVAC units, washing machines and water heaters. This small and inexpensive device will send an alert to your smartphone if it detects a leak. Condensate Pumps and Float Switches. An HVAC system produces condensation as it works. This excess condensate is usually drained safely away, but naturally occurring debris like dust and rust can sometimes cause the drain to become slow or clogged. A condensate pump will actively pump the excess water away from the unit instead of passively relying on gravity to drain it away. Whether your HVAC unit can be equipped with a condensate pump or not, we also recommend installing a float switch; this inexpensive device is designed to detect when the unit is leaking and prevent damage by shutting it off. Float switches can be installed on either a drip pan or the unit’s drain pipe. Caretakers. If you are away from home, enlist the help of a trusted caretaker to check on your home regularly. Make sure they understand where the home’s main water supply is located and how to shut it off in the event of a leak. We recommend they check on your home at least once a day during mild weather and more frequently during cold snaps. Emergency plans. When water is flowing, every minute is crucial. Create a list of preferred vendors and emergency processes. Share your plans with your caretaker, and make sure they are empowered to take action in your absence. Enlist the help of a PURE Member Advocate. A Member Advocate can assist you with any of the loss prevention considerations above. This includes connecting you with specialized services, like discounts or rebates on certain technology and complimentary background checks for caretakers or other domestic staff. They can also help you create a list of preferred vendors in your area as you develop your emergency plan. Call us at 888.813.7873 or email memberadvocate@pureinsurance.com.